The Tragically Hip, whose frontman Gord Downie was diagnosed with terminal brain cancer, have performed their last concert at the end of an emotional farewell tour. The Canadian blues and rock band drew a sell-out crowd to the last show in Kingston, Ontario, on August 20, broadcast live across the country. 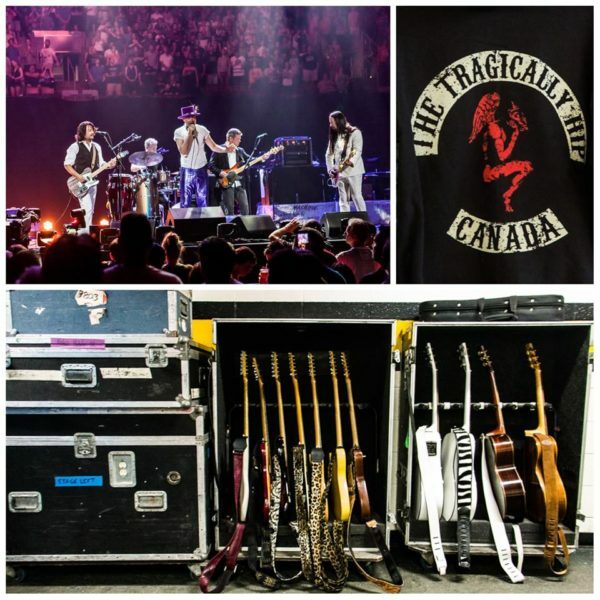 Canadian Prime Minister Justin Trudeau, who was at the live show, said The Tragically Hip had “been writing Canada’s soundtrack for over 30 years”. Gord Downie, 52, announced his illness in May. The news of his illness caused shock across Canada. The CBC called Gord Downie Canada’s “unofficial poet laureate”. The 15-stop Man Machine Poem tour “left a trail of heartbreak but also celebration across the nation”, the Globe and Mail reported. Justin Trudeau tweeted after the concert that The Tragically Hip would be “forever in our hearts and playlists”. The prime minister also tweeted a picture of himself writing on a wall of messages to what he dubbed “Canada’s band”. Formed in the 1980s, the band penned lyrics which explicitly referenced Canadian life, with a small-town charm that won the country over. The Tragically Hip started as a college band working the local circuit and then took off, but their success across 14 albums was mostly confined to within Canada. Known simply as The Hip to many Canadians, their songs became part of a national identity. Kingston designated on August 20 as The Tragically Hip Day in honor of its local heroes. The Kingston concert was broadcast on Canadian TV and was shown at hundreds of public screenings across the country in bars and outdoor venues. The final concert, at the Rogers K-Rock Center, sold out in minutes. Topics to do with The Hip concert trended on Canadian social media on August 20.